Last weekend was a weekend of firsts. 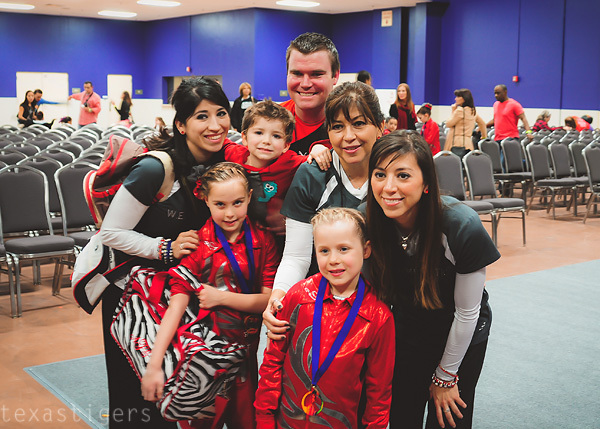 Micah's first basketball meet and Abby's first 'big' gymnastics meet. This was a huge meet with teams even coming from Mexico to compete. 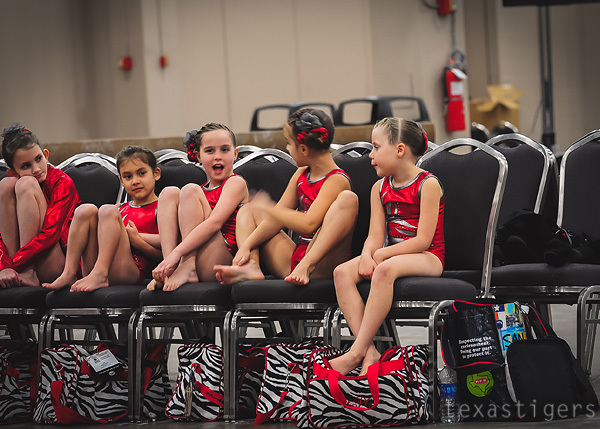 It's more a meet for the higher (lvl 6 and up) girls but they host meets for the littles too. 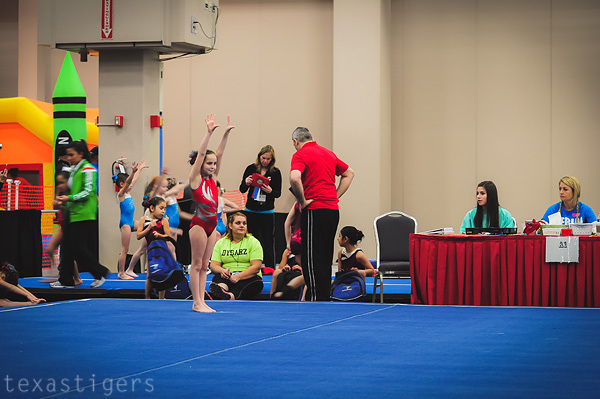 It was a big change from the little gyms the girls have previously competed in. Instead the competition was at the convention center. The girls were all so impressed they got credential badges to show they were competing. 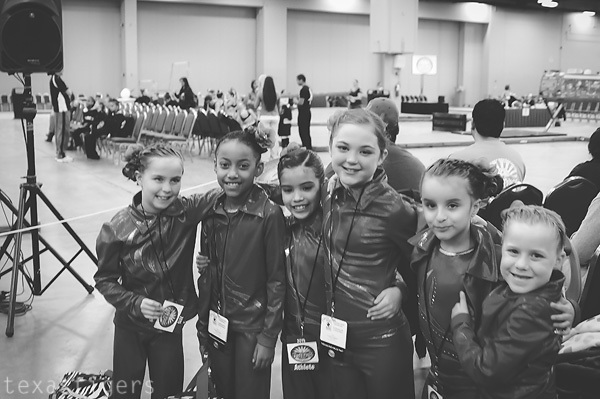 I can't say I blame them - little things like that can impress me too ;) These girls have competed together this past season and it's so sweet to see their friendships growing. The team started off on beam and it was not Abby (or pretty much anyone else's) best showing. 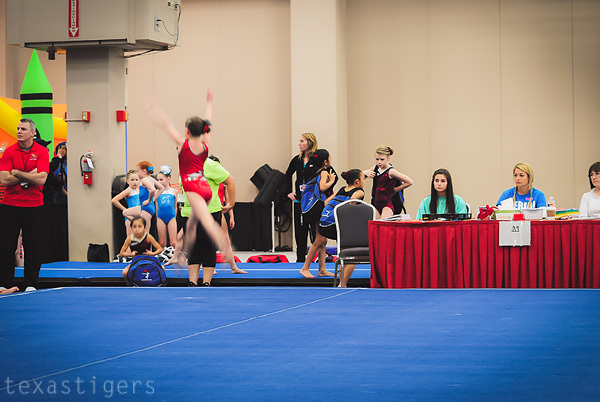 I'm not sure what was up but beam scores seemed really low for all the team. 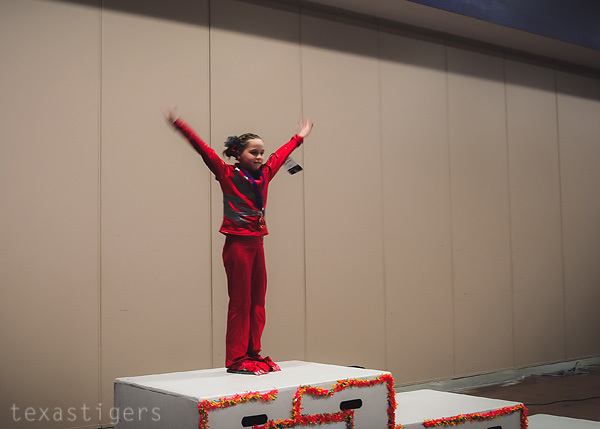 This is coming right after the meet in which Abby had her highest beam score and this weekend it was her second lowest but yet she looked like she did better than that to me. I got really nervous for Abby at this point knowing she had a lot to make up for to score higher than the coveted 36 to move to level 2. I also knew from past scores she was fully capable of making it up but it wouldn't be easy. The girls didn't seem to let the beam get them down too much and were smiley waiting for their turn on floor. Abby's floor routine was fantastic and earned her, her personal best score and 3rd place on floor! My nerves went down a little bit after seeing that beautiful performance. Finally bars. She needed a good score - a 9.2 to be exact - didn't need a personal best (9.3) but better than her average score had been over the season. Her warm up run throughs made me extremely nervous because I could see she wasn't keeping her legs together as she went through the motions. Finally it was her turn and she looked great - legs together, everything went smoothly. It was a ball of nerves waiting for the score to come up on the app (since that was loading faster than the tvs that were showing the scores) Finally it came up - a 9.4! 4th place on bars and that means she had a 36.2 her personal best AA score! We are so proud of this girl and she was so so happy knowing she would move to level 2 as soon as she got the skills down. That's so awesome!! Congrats to Abby! !